Every once in a while archaeologists (and sometimes regular Joes) make some remarkable discoveries. Stunned, they are often unable to explain what it is they�ve found, how it came into existence, or ascertain its value. 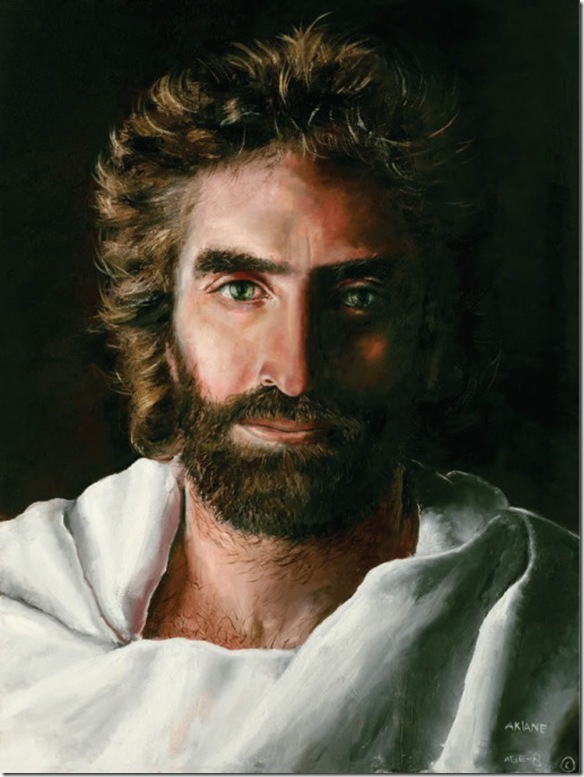 This is a comprehensive list of such artifacts; artifacts that many believe should have never existed given the discerned age/period of their creation. In June 1936 (or 1934 according to some accounts), Max Hahn and his wife Emma were on a walk when they noticed a rock with wood protruding from its core. They decided to take the oddity home and later cracked it open with a hammer and a chisel. 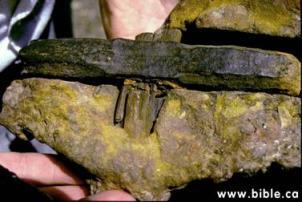 Ironically, what they found within seemed to be an archaic hammer of sorts. A team of archaeologists checked it, and as it turns out, the rock encasing the hammer was dated back more than 400 million year; the hammer itself turned out to be more than 500 million years old. Additionally, a section of the handle has begun the transformation to coal. The hammer�s head, made of more than 96% iron, is far more pure than anything nature could have achieved without an assist from modern technology. As man digs and scrapes and drills into the mysterious earth, many surprising finds are made. It follows that mining and farming have been fruitful sources of curious finds in the past. We can feel strong regrets that as both occupations have become more and more mechanized, fewer and fewer finds of value for scientific study will occur. The following interesting items make two important points. If conventional dating is followed, ancient man seems to be far more ancient than he should be. In fact, he must have been thriving before he is supposed to have evolved. Second, ancient man was a very sophisticated person. There is no indication that his brain gradually evolved. Both of these conclusions, obviously, are completely opposite to evolutionary theory. One of the most prodigious lava flow in the history of the world occurred in the Pacific Northwest. The lava spread over an estimated 200,000 square miles in depths up to 5,000 feet. In 1972, a competent geologist stated that the eruptions took place a mere fifteen million years ago. Much of Washington, Oregon, Idaho and portions of neighbouring states was covered. The immense age of the deposit "can easily be imagined by the fact that the Snake River has cut canyons through the deposit to depths of up to 3000 feet". One ancient shaft was drilled 210 feet down into solid rock. An altar for worship was found there. Other finds include the following: a mortar for grinding gold ore at a depth of 300 feet in a mining tunnel, a mortar and pestle weighing 30 pounds, beads, perforated stones, a 40-pound oval granite dish. One human skull was found at a depth of 130 feet under five beds of lava and tufa separated by layers of gravel. Man came before the lava flowed, and deep canyons have been cut by rivers since the lava spread. An amazing number of stone relics have been found. The finding are almost always in gold-bearing rock or gravels ( Victoria Institute , 1879, 15:193-198). A California newspaper reported the find of an elaborately carved rock and other worked stones weighing up to 800 pounds which had been found in hydraulic operations hundreds of feet underground. The original site was an ancient river bed dated long before the last Ice Age (Edward, 1964, p.109). Nothing describes what has been discovered in California quite as well as Job 28 (TEV). Similar locations have been studied in many parts of the world. Read this detailed and sophisticated memory of what mining in ancient times was like. Far from where anyone lives or human feet ever travel, men dig the shafts of mines. There they work in loneliness, clinging to ropes in the pits. There are mines where silver is dug. There are places where gold is refined. Men dig iron out of the ground and melt copper out of the stones. Men explore the deepest darkness. They search the depths of the earth and dig for rocks in the darkness. Food grows out of the earth, but underneath the same earth all is torn up and crushed. The stones of the earth contain sapphires, and the dust contains gold. No hawk sees the roads to the mines, and no vulture ever flies over them. No lion or other fierce beast ever travels those lonely roads. Men dig the hardest rocks, dig mountains away at their base. As they tunnel through the rock, they discover precious stones. They dig to the sources of rivers and bring to light what is hidden. The value of wisdom is more than coral, or crystal, or rubies, or the finest topaz and the purest gold. 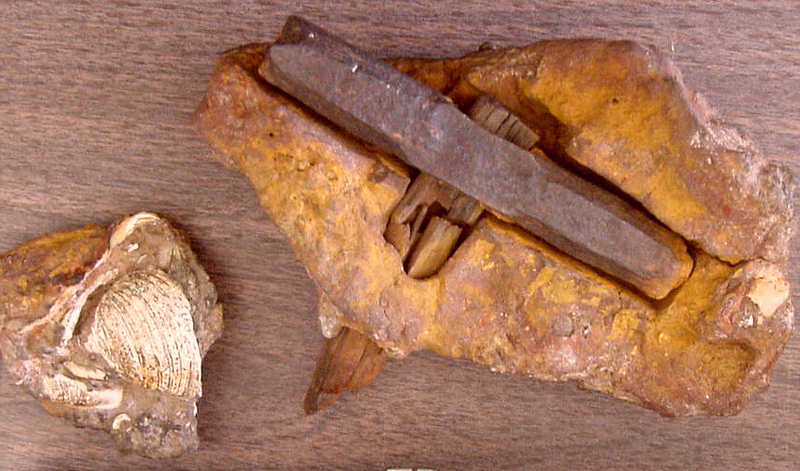 In the museum at Moses Lake, Washington, are some very crude scrapers on exhibit which were found under a glacial morain. This would appear to date man in Washington to a time before the Pleistocene epoch, which scientists are reluctant to do. A similar discovery was made near Sudbury, Ontario, Canada. Crude choppers and scrapers of quartzite were found deep in the earth and had been tumbled and mixed in glacial till. Again this is evidence that man lived there before the glacial advance. Scientists do not want to put man in America that long ago (Folsom, 1971, p.70; p.184). Such finds are no problem for creationists who see no conflict for such finds within a biblical time framework. A strange account comes from the little village of Plateau City, Colorado, a short distance east of Grand Junction. A resident was digging a cellar in 1936. At a depth of ten feet he found paved tile laid in some kind of mortar, different from any other construction in the valley. While the tiles are dated anywhere from 20,000 to 80,000 years old, they lie in a Miocene formation, which could make it up to 25,000,000 years old by conventional dating (Edward, 1962, p.100-101). In 1871 near Chillicothe, Illinois, well drillers brought up a bronze coin from a depth of 114 feet. This remarkable discovery was described in the Proceedings of the American Philosophic Society . This is additional evidence that man had been present there. Rapid change of the terrain is also indicated (Edwards, 1962, p.101). Heizer notes a number of impossibilities according to commonly accepted geological dating: a hyena tooth sawed by a flint before it became fossilized, cutting operations on the fossilized bone of an extinct rhinoceros and on other animals at a site near Paris, and evidence of the use of a sharp tool on the horn of fossilized rhino remains in Ireland. Under the surface of the North Sea the trunk of an oak was removed from a long submerged forest. The trunk showed the marks of a hatchet on it. (Heizer, 1962, p.107-114). Conventional theory has early hunters migrating from Asia to America. 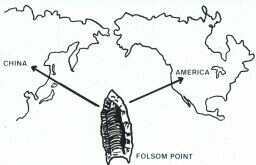 One of the best known early projectile points is the Folsom point, and the identical pattern is found both in China and over much of America. It is of particular interest that this point is dated as early as 10,000 B.C. in America, but no earlier than 2000 B.C. in China (Mertz, 1972, p.99). Theory, however, requires the points in China to be older. Should "age" depend on where you find it? It is said that coal is a by-product of decaying vegetation and that it takes from 30 to 300 million years for its natural production. Thus when "impossible" items like jewellery, a spoon, a metallic cube and other man-made objects are found in lumps of coal, we are inclined to perceive human history in a dramatically new light. From time to time, unusual artifacts are found in strange places. Some of these items are "problematic" to the accepted teaching of the day for those who are indoctrinating students that the world is billions and billions of years old and the result of natural phenomenon . . .
For example, how do coal miners find man-made artifacts in coal veins buried deeply below the earth's surface? There is a growing list of these items that made the news in their day, but then were put aside as unexplainable anomalies by those that is indoctrinating students that the world is billions and billions of years old. When we put them all together, however, their existence challenges everything we thought we knew about the world and human history. There are many hard-line evolutionary fundamentalists who would like to sweep such things under the rug so they don't confuse their archaic belief systems. Nevertheless, these things exist. We offer a list of the ones we presently know about. We are sure there are many others which we don't know about or have gone unreported. The Morrisonville, Illinois Times, on June 11, 1891, said Mrs. S. W. Culp found a circular shaped eight-carat gold chain, about 10 inches long, embedded in a lump of coal after she broke it apart to put in her scuttle. The chain was described as "antique" and of "quaint workmanship." The story said only part of the chain was revealed when she first broke open the coal, and that the rest of the chain remained buried within the coal. The coal came from one of the southern Illinois mines. 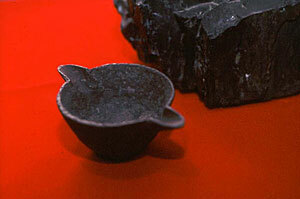 Within the Creation Evidence Museum at Glen Rose, Texas, can be found a cast iron pot reportedly found in a large lump of coal in 1912 by a worker feeding coal into a local electric power plant. When he split open the coal the worker said the pot fell out, leaving its impression in the coal. The coal had been mined at Wilburton, Oklahoma. The bell and pot are strong evidence of the Genesis story of Tubal Cain, who forged metals prior to the flood. Yet another story found in Epoch Times told of a Colorado rancher who in the 1800s broke open a lump of coal, dug from a vein some 300 feet in the earth, and found a "strange-looking iron thimble." The item was dubbed the "Thimble of Eve" by the media. Since its discovery, however, and due to mishandling by its owners, the iron corroded and disintegrated. The Salzburg Cube is yet another ancient puzzle found by a worker named Reidl in an Austrian foundry in 1885. Like the others, this man broke open a block of coal and found a metal cube embedded inside. 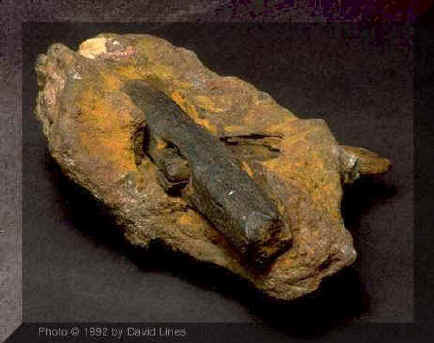 The mining engineer wrote off the item as a meteorite, but more recent analysis shows that the object was a forged iron and obviously hand crafted. The item is not perfectly square, with slightly rounded sides on two ends. It measures only two and a half by one and four-fifth of an inch. There is an incision that runs around it horizontally, suggesting it may have been a machine part. In 1944, as a ten year old boy, Newton Anderson dropped a lump of coal in his basement and found that it contained this bell inside. The bituminous coal that was mined near his house in Upshur County West Virginia is supposed to be about 300 million years old! What is a brass bell with an iron clapper doing in coal ascribed to the Carboniferous Period? According to Norm Sharbaugh�s book Ammunition (which includes several "coal anecdotes") the bell is an antediluvian artifact (made before the Genesis Flood). The Institute for Creation Research had the bell submitted to the lab at the University of Oklahoma. There a nuclear activation analysis revealed that the bell contains an unusual mix of metals, different from any known modern alloy production (including copper, zinc, tin, arsenic, iodine, and selenium). Genesis 4:22 states that Tubal-Cain was "an instructor of every artificer in brass and iron..." Perhaps when his civilization came to an end in the flood, this bell was buried with a mass of vegetation that became coal and ended up thousands of years later in Newt Anderson�s coal bin. 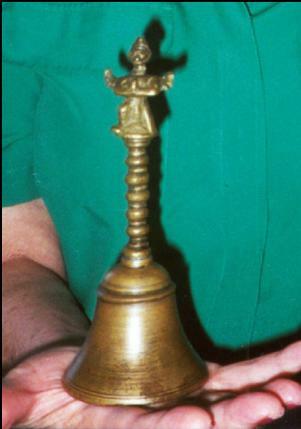 The bell was prominently featured in the 1992 CBS docudrama production called Ancient Secrets of the Bible and is now part of the Genesis Park collection. For more detailed pictures of the bell and the demon-like figure on top. A handful of other such accounts have been recorded, including the intricate gold chain found in coal (Sanderson, Ivan T., Uninvited Visitors, 1967, pp. 195-196.) and the cast iron pot found in a coal seam at the Municipal Electric Plant in Thomas, OK (now archived at Creation Evidence Museum). CLICK HERE for more information on this remarkable find. A large ceramic spoon or ladle was found in the ashes of a coal stove by a woman in Pennsylvania in 1937. The item was sent to The Smithsonian Institute for examination, and remained buried in the volumes of artifacts stored there until its existence was made public in 1976. Workers in stone quarries also have found impossible objects. It is said that in 1844, quarry workers at Rutherford Mills, England, found a piece of gold thread embedded in rock about eight feet in the ground. 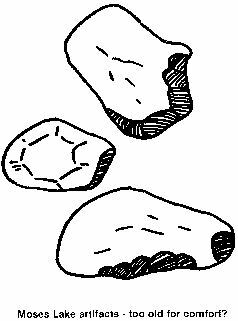 The London Times in 1851 reported that Hiram DeWitt, of Springfield, Mass, brought a piece of quartz home from a trip to California. When the stone was accidentally dropped it split open and inside was a cut-iron six-penny nail. The nail was described as perfectly straight and with its head still intact. A British publication of 1845-51 contained a report by Sir David Brewster that a nail was found in a block of stone from the Kingoodie Quarry, North Britain. The head of the nail was exposed but an inch of it was embedded in the stone. The oxidized remains of a tapered, threaded iron screw was found in a piece of feldspar removed from a mine near Treasure City, Nevada, in 1869. Then there was a "mystery object of exquisite workmanship" found by workers in solid pudding stone, about 15 feet in the ground, at Dorchester, Mass. A story in the June, 1851 edition of Scientific American said the artifact was a "bell-shaped vessel" four and a half inches high, six and a half inches wide at the base, and two and a half inches wide at the top. The sides are inlaid with images of flowers, fines or a wreath. The object appears to be a composition of metals, and inlaid with silver.